Well, that Angie over at The Novice Gardener, she sure knows how to throw a party! I had so much fun last week at Fiesta Friday that I thought I would go again! Wow, we feasted like you wouldn’t believe and I met so many really amazing fellow bloggers. What a hoot! So, for some inspiration about what to bring, I hit my big binders…I don’t know if you have any of these, but they are the ones you have been filling up for years with recipes torn out of magazines and newspapers; photocopies of recipes your friends and colleagues have given you and the like…you know! When my eyes landed on this recipe, I knew I had my dish. When my husband and I entertain, we love to serve an array of appetizers, so I am always on the hunt for something new and interesting. This dip is perfect for a party! 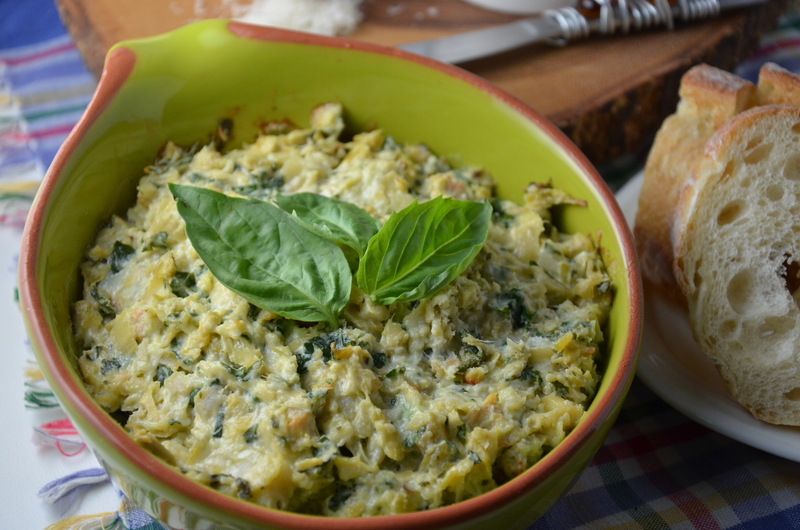 It is very similar to our favourite warm artichoke dip that we order at one of the restaurants around here. The difference is that this one has tons of zesty basil instead of spinach and the olives impart a more bold, earthy flavour. The original recipe called for green olive tapenade. I couldn’t find any so I used marinated, giant, green Sicilian olives and just chopped them in the food processor. It also called for frozen artichoke hearts, which I couldn’t find either. The marinated artichoke hearts that I used worked great. It also called for a soft, fresh cheese like Boursin. I don’t know if everyone reading this post is familiar with this over-the-top scrumptious cheese from France, so I have included a picture of it at the bottom of the post. This recipe was from a Bon Appétit magazine. I don’t know which year or month, because it’s from the binder that I started long before I had ever dreamed of blogging, not thinking that I would have to reference it one day. Happy Fiesta Friday! I hope you enjoy the dip! 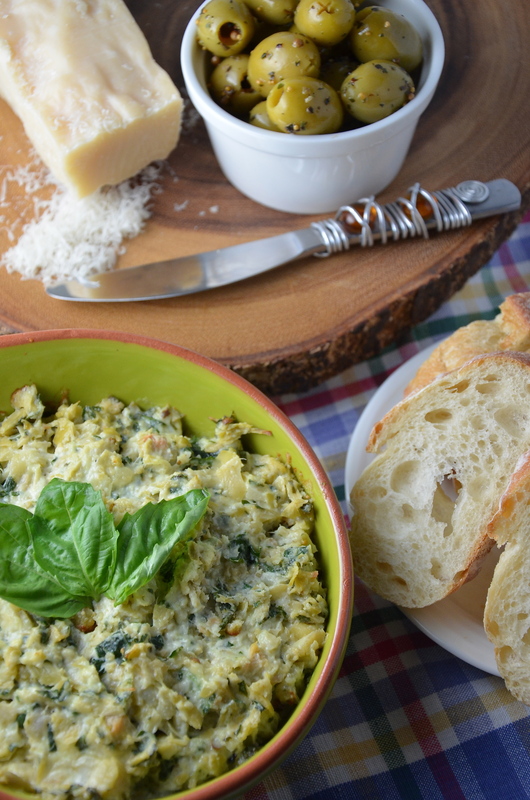 Add artichoke hearts and basil leaves to food processor and chop coarsely. Remove this mixture to a 4 cup baking dish. If using green olives rather than the tapenade, place olives in the food processor and chop coarsely. Add this or the tapenade to the previous mixture. Add Parmesan and Boursin to the mixture and stir gently with a wooden spoon. Bake until hot, about 30 minutes. Yes indeed! That’s what my husband and I said as we gobbled down the whole bowl! Sounds and looks positively delightful! It’s just one of those easy, yet amazing party dishes! Thanks for commenting! I hope you do! Let me know what you think of it!! OK, I’ll send it right over 🙂 I love artichokes too….mmmm, I’m thinking on pizza right now! Thanks for stopping by!! I was reading through this post and let out an audible “ooh” as soon as I saw the first picture. What a neat idea to add olives to a dip! Interesting, huh? I had never thought of it either, but it really works!! All of a sudden I’m hungry for bread and dip. Just made a call to hubby who is in the store to pick up some. He’s in the store right now, dispatched previously to pick up biscotti b/c I just saw what Ngan brought. This may be a virtual party, but the gaining weight is real! Lol. Btw, Julianna, are you here in the States? I’m trying to figure out who the Americans are among us. Ha ha, funny how that works, eh? After last week’s party I had had a craving for all sorts of dishes your guests brought! I just wish I had more time to cook/bake them all…so frustrating! Oh, and I am Canadian 🙂 Don’t hold it against me if you watched the Women’s Hockey Gold Medal Game at Sochi 🙂 ! Anyway, thanks for hosting this fun Friday night event – I love it!! 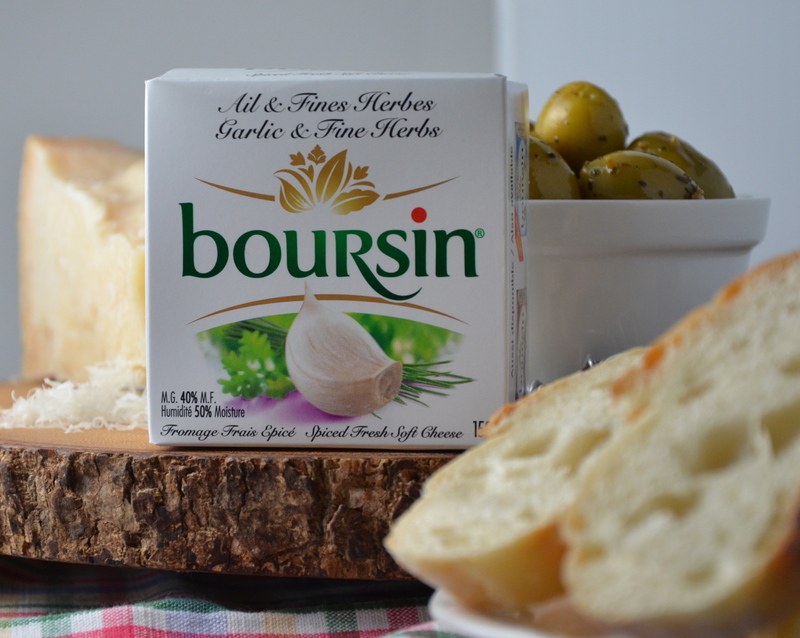 Yes, we almost always put some Boursin on a cheese plate too! I love it. Thanks for directing me to your Summer Tomato Appetizer – I am going to look for it ASAP, because I bought a two-pack of Boursin to make this dish and have one left over! 🙂 Happy Fiesta Friday to you too! I hope you do try the dip and that you like it! 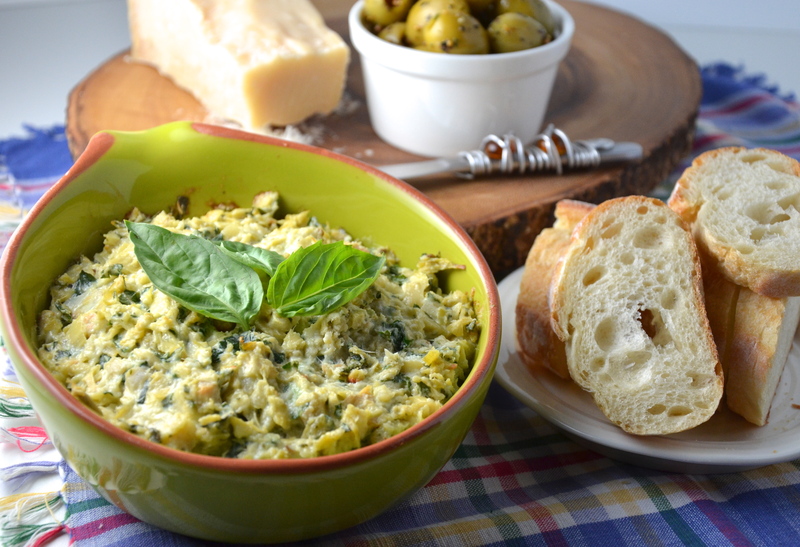 Oh, artichoke, olives, and basil–all my favorite things! We also like to entertain but I have never made a dip of this sort before to serve. I’m looking forward to making it someday for a game night. And–so glad to have discovered you and your blog through Fiesta Friday last week! Yes, this is perfect for game night or entertaining! It’s so quick to prepare so you can attend to other things, like having fun with your friends!! So nice to “meet” you too and your blog – isn’t this fun? Happy Fiesta Friday! Yes, she sure knows hot to throw a party! Glad you could stop by! This looks divine- I definitely need to try this! Also, I love boursin spread too! I hope you do try it! Please let me know how you like it when you do! Thanks so much for stopping by. This looks incredible! I have a personal and loving relationship with each and every one of those ingredients. Together they must be glorious! I can’t wait to have a party (or a weekend movie night alone 😉 ) and make this! Isn’t it great when you can put all of your favourite ingredients in one dish? It’s like a party in itself!! So glad you stopped by! Thanks so much! I hope you’re keeping warm where ever you are! Nothing like some lovely warm comfort food to help with that! Hope you have a great week. Looks so yummy! I like that you kept it chunky.! Yes indeed! Nothing like lovely chunks of artichoke and olives!!! Are you going to Fiesta Friday? Perfect! I know you will bring something awesome! See you there, then! I’m so glad you think so! Have a lovely week!